Art Ichol, a first-of-its kind multi-disciplinary arts centre in Maihar, Madhya Pradesh has to its fame the National Tourism Award for being the most unique and innovative art destination in India. It is equally renowned for organising artist-in-residence programmes for international and national artists of repute and founder Ambica Beri has hosted more than 50 artists from over 20 countries ever since the centre’s inception in 2015. Beri now brings to Delhi some of the most path-breaking sculptural works created during such residencies in a show. The show features nearly 75 works in mediums like stone, bronze and ceramic by 50 Indian and international artists. Participating artists include Saturo Hoshimo (Japan), Sandra Black (Australia ), Eugenia (Latvia), Anatolli (Latvia), Cynthia Seigal (USA), Kim (Korea), Alvin Tan (Singapore), Naidee Changmoh (Thailand), Maite Delteil (France), Mami Koto (Japan), Julia Klemm (Germany), Maria Bosch (Spain) and Indian artists like Laxma Goud, Anupam Sud, Jayasri Burman, Paresh Maity, Madhvi Subramanium, Anjani Khanna, Ramesh Chandra, Milan Singh, Megha Joshi, Ravi Kumar, Aditi Saraogi, Debabrata De, Falguni Bhatt, Uday Singh amongst others. Debabrata De is in his late fifties and a Diploma holder from the Indian College of Arts and Draftsmanship, Kolkata. A recipient of several award winning works, he has been working in bronze and terracotta, creating his engaging sculptures of rural folk, that invariably become a conversation piece where displayed. In a relatively new medium for him, ceramics, he has maintained his signature style. 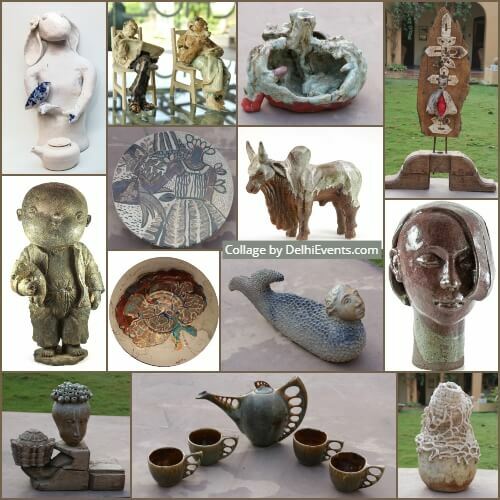 Uday Singh is a farmer turned ceramic artist. Uday first experimented with clay at Art Ichol and discovered his latent talent which translated itself into his current passion. Being a farmer, his ease with clay and the animal forms he creates, is natural. Uday’s very first formal exhibition in Kolkata was a sell-out with people asking for more. Naidee Changmoh is a Thai artist, who was fascinated by the sounds and smells of Ichol village and Maihar, and created a lot of Gods and Goddesses amongst ordinary men with each figure resembling his own self. Holly O’Meehan’s ceramic practice took a turn when she started to combine crochet with ceramics. She loves the physicality of creating with her hands using ancient craft techniques. Her works attempt to honour those ways of old in a society dense with modern techniques. During her stay at Art Ichol, she used local yarn and rope to crochet and combined the same with ceramics.